MURATEC for the first time in punch press history, introduced in 1994, a new concept in ram drive technology, which incorporated a toggle mechanism driven by an AC servo motor. Hydraulic oil-less sheet metal processing enables ecological machine operations saving environmental natural resources. 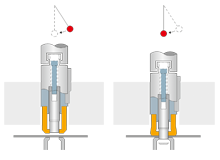 The positive Punch-in and Pull-out design of the ram, which is mechanically linked to the punch holder during the punching cycle, guarantees positive punching. This design has already been field proven for its high strength, precision and simplicity of tooling. By combining this feature with the newly innovated servo motor driven ram, the reliability of the Machine has been greatly enhanced. Muratec electric servo driven punch press has been evolving continuously! The newly engineered ram drive of M2044TC has become simpler and more rigid. 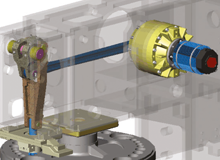 With the elimination of the Cam Drive Cylinder, the servo motor can control the ram stroke directly, resulting in higher punch speeds and productivity. The reduction of the number of components has maximized stability during operations, decreasing maintenance and increasing longevity. The new drive has a more efficient motor that runs cooler and requires less energy. In the M2044TC, the ram servo motor consumes power only during the punching process, thus reducing running costs drastically. The absence of a hydraulic unit on the M2044TC gets rid off hydraulic unit and oil maintenance, disposal of waste oil, and periodic oil replacement. This saves on hydraulic oil and maintenance costs, thus reducing running costs. The M2044TC does not require machine warming-up cycle, thus enabling quick machine start.